Why Use a Rug Doctor? When you have five children your carpets are guaranteed to get dirty, and cleaning them is something that you should be doing on a regular basis. When you do clean them you will be shocked at how much dirt and grime comes out of your carpet. I know I was shocked when I recently cleaned our bedroom carpet. 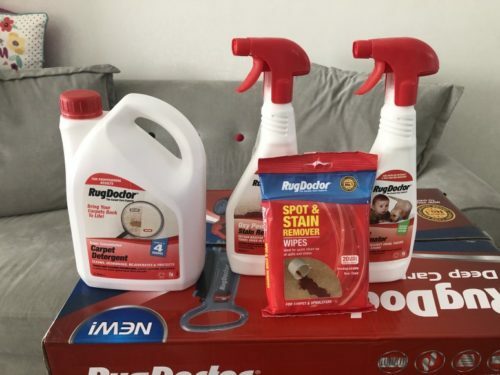 I have teamed up with Rug Doctor, and they recently sent me a selection of cleaning products, and the all new Rug Doctor Deep Carpet Cleaner to review. When you have six year old twin girls who quite often run around the house whilst eating and carrying drinks, not very carefully I might add, there is always going to be accidents. It’s just one of the joys of parenthood that nobody tells you about! This can be used with or without the Deep Carpet Cleaner. It is oxygen boosted to help remove tough dried in stains. It’s particularly useful for difficult stains such as red wine or coffee. I used it on make-up on bedroom floor and was very impressed how quickly it removed it. This is particularly good and very effective at removing urine, faeces and vomit stains. It totally destroys the underlying odours, whether it be from pets or kids! It can also be used on mattresses. We all know what it’s like when you have young children, especially when they are potty training. Accidents happen often, and how often do they miss the bowl when they have a tummy bug and vomit goes everywhere? This is the perfect solution. These are fantastic. All the benefits and cleaning solution of Rug Doctor in a wipe for use on carpets and upholstery. Perfect for those quick clean-up of spills and stains. The products are excellent and will solve all of your stains that happen on a regular basis in your home. They certainly will in my home. I mentioned at the beginning of my article how important it is to keep clean your carpets on a regular basis. So when Rug Doctor said they were sending me a Deep Carpet Cleaner, I thought yes! Well the carpets definitely need a clean and it will good to put the cleaner through its paces. 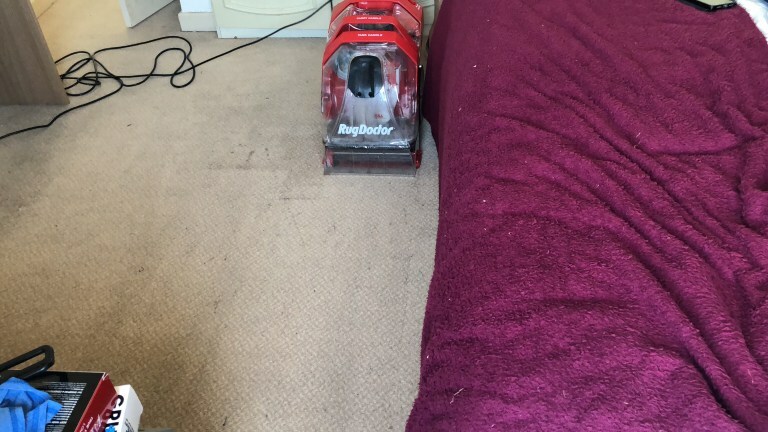 Previously you generally only rented the Rug Doctor, but now you can own the carpet cleaner which I personally think is fantastic because you can clean your carpets whenever you want too. The Deep Clean Carpet comes basically ready to use. There’s no real assembly. It’s simply a case of take it out of the box, fill it up with water and detergent and then plug it in and that’s it. What is so special about the Rug Doctor Deep Carpet Cleaner? Well, I shall tell you! Rug Doctor is easily the best carpet cleaner and has been leading the field for years. It is an award winning carpet cleaner which features unique technology which will leave your carpets looking absolutely beautiful in no time. Using very strong dual cross brushes it will clean in one pass. The brushes oscillate through the carpet fibres which in turn cleans, grooms and polishes the carpet from every angle. It also comes equipped with a super boost spray to remove the toughest of stains and high traffic areas such as a hallway. It also has powerful suction technology that means your carpets dry quicker, removing more of the moisture. It also has a hand held tool that can be used for those very stubborn stains. My overall opinion of the Rug Doctor products and Deep Carpet Cleaner is it is a very impressive carpet cleaner, and I would highly recommend it. It’s great value for money at just £299.99. 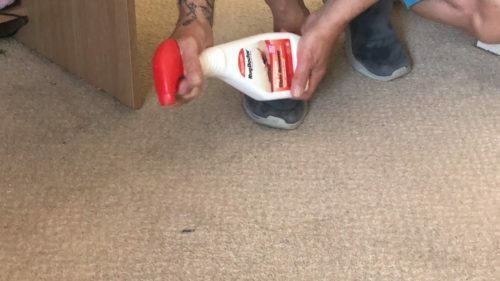 Check out my video below of the cleaning products and carpet cleaner in action. You will be surprised at how much dirt it removed from our carpets. This entry was posted in Carpet Cleaning Tips, Carpet Cleaning, Stain Remover, Stains. Bookmark the permalink.